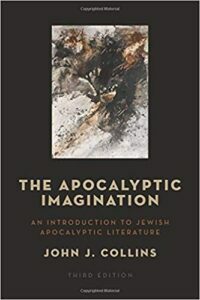 The Apocalyptic Imagination is absolutely essential for anyone interested in early Apocalyptic literature. This book is a thorough introduction to literature such as Daniel, 1 and 2 Enoch, and and 3 Baruch, 4 Ezra, Revelation, the Sibylline Oracles, the Apocalypse of Abraham, and the Testament of Abraham. After a lengthy treatise on the background and interpretation of 1 Enoch, Collins moves on to the book of Daniel, the only example of apocalyptic literature in the Hebrew Bible. Daniel was written in the time of Antiochus Epiphanes, an argument formulated as early as the 3rd century by the neo-Platonic philosopher, Porphyry. Porphyry proposed that since Daniel ‘predicted’ the course of events up to the time of Antiochus Epiphanus but not beyond it, it could not be dated during the Babylonian exile. Scholars universally accept that prophecies took place ‘after the fact.’ Collins continues with explanations of the dream of the four kingdoms in Daniel 2, the ‘one like the son of man’ vision and ‘the holy ones of the most high shall receive the kingdom and possess the kingdom for ever’ passage in Daniel 7, and the revelation of Daniel 10-12. A discussion of the Oracles and Testaments follows. Here, Collins presents the Sibylline Oracles within their Hellenistic background and describes key passages from them. A sibyl was usually an ecstatic woman who uttered prophecies. The Testament literature, on the other hand, were discourses delivered as one awaited imminent death, and the literature typically took the form of a father addressing his sons or a leader addressing his people. Some of the prominent Testaments addressed are the Testament of Moses (early 1st century CE) and the Testaments of the Twelve Patriarchs. Qumran is discussed briefly in this book, as Collins has devoted an entire book to the apocalypticism in the Dead Sea Scrolls. This chapter gives more of a history of the Qumran sect and some of their fundamental beliefs such as dualism particularly between light and darkness, the periods of history, their messianic expectation and belief in two messiahs, and finally, the afterlife. After a brief chapter on the Simultudes of Enoch, Collins addresses some of the literature that arose after the fall of the Second Temple in 70 CE. Of particular interest are 4 Ezra and 2 Baruch, which describe the fall of the Temple in allegory form as the destruction at the hands of the Babylonians. A third text, the Apocalypse of Abraham, also written around this time, is a supernatural revelation on the history of the world and concerns questions of evil and the chosen people. Azazel plays the main character that has dominion over those who do evil. Chapter 8 discusses the apocalyptic literature from the Diaspora in the Roman Period. Here, again, the Sibylline Oracles are discussed as well as 2 Enoch, 3 Baruch, and the Testament of Abraham. The final chapter addresses apocalypticism in early Christianity including a discussion on Jesus as eschatological prophet, and the son of man and messiah titles. There is a brief discourse on Paul’s eschatology, and finally Revelation is discussed. This book is a must-read for anyone looking for a background in apocalyptic literature. Collins provides an easy to follow framework with lots of textual references to back up his conclusions.